I really like the concept of VESA compliant PC's that you can mount onto the back of your TV. Despite the fact that MSI's Atom-powered WindBOX is meant to ride your monitor while providing all the computing power it can handle, the employees at the company's CeBIT booth felt it more proper in public to simply leave it laying out front. Though we were a touch dismayed, this choice did give us a better opportunity to shoot it from all angles, and we must say, this sucker is pretty thin. We're still hearing that MSI is aiming this more at enterprise customers rather than mainstream consumers, but there's nothing you can't buy if you know the right channels. Peep the gallery for more of this awkward, dismounted nettop. 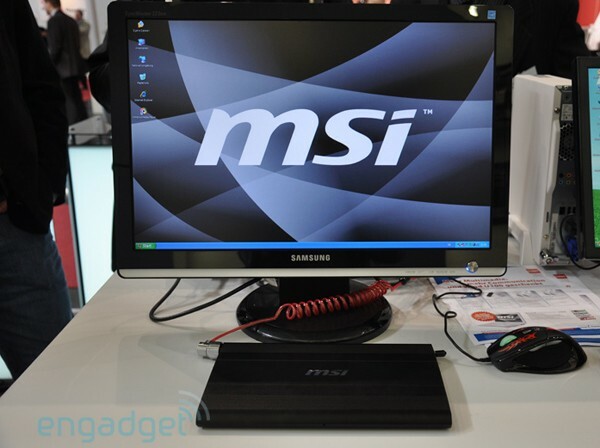 MSI WindBOX dismounts LCD, acts all proper at CeBIT originally appeared on Engadget on Thu, 05 Mar 2009 07:58:00 EST. Please see our terms for use of feeds.